Whereas Amazon’s founder and CEO Jeff Bezos recently became the world’s richest person with a $230,000 a minute income, his company had come under heavy criticism for facilitating low wages and poor working conditions. When Amazon declared its Prime Day slated for July 16, several thousands of workers in Spain and Germany declared strikes, and they attracted workers from many other countries, bringing to attention a demand to boycott Amazon between July 10-16. Bezos who has a long history of thwarting unionization efforts everywhere including in the United States, recently became the focus of a legislative proposal when Senator Bernie Sanders introduced the “Stop BEZOS Act” last month, that sought to tax companies which had employees so poor that they were receiving federal welfare benefits. The wage increase will benefit more than 375,000 workers, out of 575,000 workers employed by Amazon globally. 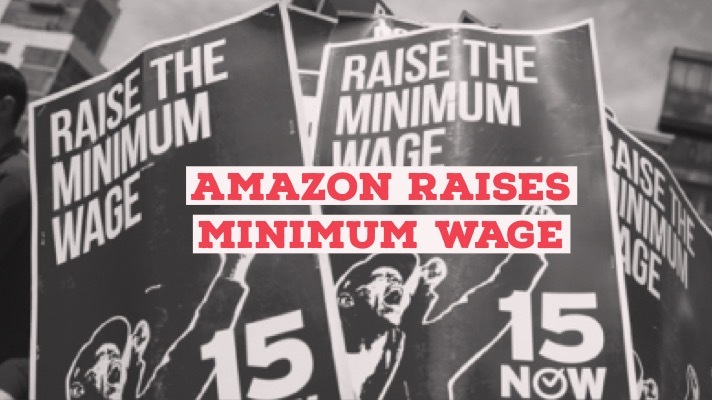 Amazon has also announced that it will advocate for an increase in the federal minimum wage in the US (which is currently $7.25/hr).